Egypt's king, Ramses II, written about in the Old Testament, is now thought to have reigned between 1290-1224 B.C.E. 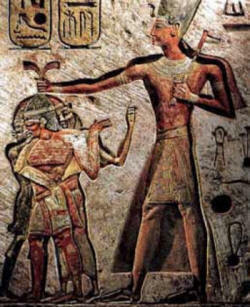 The Egyptian wall art to the right depicts Ramses holding what is suspected to be three slaves. One is black, one appears to be East Asian, and the third, in the foreground, appears to be Semitic. The blacks and Semite came from close by. The East Asian leaves us wondering.